Absolutely! My image of Japan was better and better day by day! All the streets in Japan are neat and beautiful, so that I just feel comfortable even without doing anything or visiting any special views. It is not turgidly to say that I think maybe every photo that I took casually can be made into postcard. 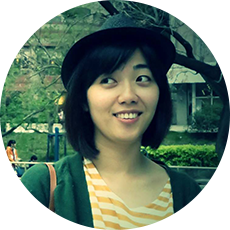 And Japanese are extremely kind and warmhearted. Everyone that I ask, no matter he/she can speak English,Chinese or not, he/she did his best to let me understand. After explaining, all of they said “have a nice trip in Japan ” to me. That really touched me. 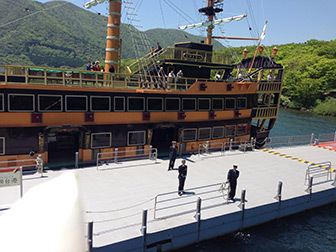 When I went to Lake Ashinoko ,I bought a sightseeing ship ticket for a round trip . However, I realized the ship stopped on a port which was not I started,and all the visitors got off. I was confused and then asked a staff. He looked my ticket and told me that this ship wouldn’t go there. After that,he took a bus ticket for me so that I didn’t need to pay for it. Then he took me onto the bus . I was so thankful. The are so many shrine in Japan! So I believe that must be an important part of Japanese culture. 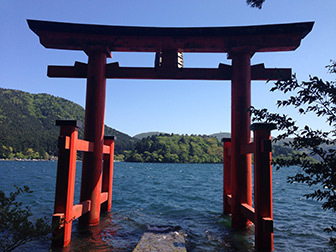 I went to the Hakone Shrine, everything in there was special for me: the architectures, the figure of Buddha, the torri, and the lovely Miko etc. I followed the local people, they washed their hands, I wash mine, they made a vow, I made a tow too. That’s interesting! All of these made me have a real feeling: Oh! I’m really in Japan! 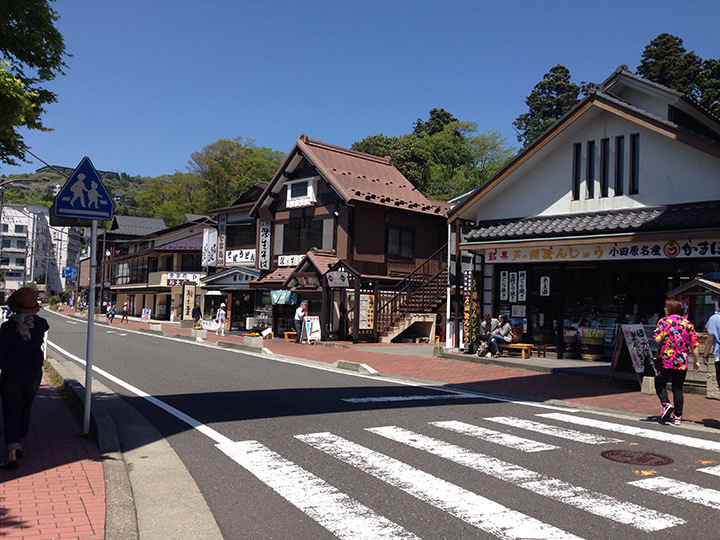 In fact , I met a lot of local people who were impressed me, Mr.Ise and Ms.Kobyashi in KAI HAKONE for example. All the people here are really really kind. 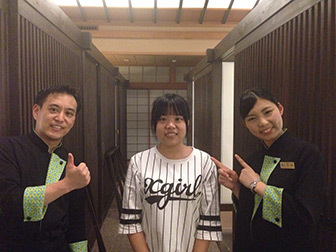 Ms. Kobayashi’s Chinese was very good.This was the first time that I came to Japan. 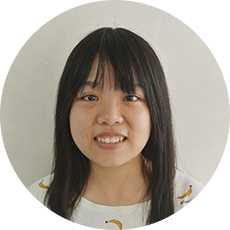 She made me felt like I was still in my mother country by speaking Chinese. Mr.Ise was the funniest person that I had ever met. It was late when I arrived at KAI HAKONE. He kept smiling during the dinnner, and he told me “don’t be nervous” again and again so that I didn’t feel any uncomfortable or nervous. Oh! He kept chatting with me, too. That looked like a conversation with a friend who I hadn’t seen for a long time. He made me feel warm and happy. Thank you so much. I have to sayit! Japanese foods are so amazing! I don’t hate fish, but I just don’t like fish very much actually. But all the fish I ate in the hotel were so delicious! I was totally attracted by those fresh and delicate foods! That was incredible for me! 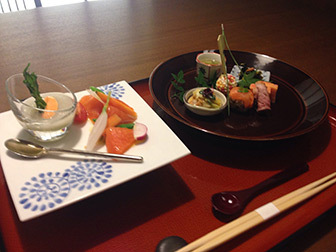 Another point is ,the process of eating Japanese foods was a little bit complicated. All kind of foods were small(I mean they smaller than the foods I ate in my hometown), but there were a lot of kinds of foods that I could eat. I had never eat anything delicious like this. It was a new and special experience to me, and I like it so much. It’s really difficult to find dustbin! So I have to keep my garbage until I find the dustbin. In fact, I usually failed to find them. Therefore,I must keep the garbage all along, and throw them in the hotel. One day , I bought an ice cream. after I finished it, I put it in a plastic bag, and then put plastic bag into my bag. Unfortunately, when I got hotel, the leftovers leaked out in my bag…However, even if I said it was not convenient that too few dustbin on the streets, I still like here. And I think maybe this convenient thing probably is the reason why the street here are so clean. 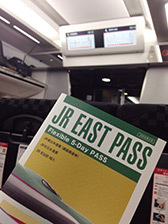 I was on the Narita N’ex with JR EAST PASS. 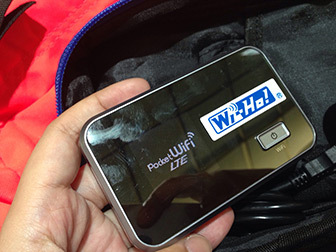 The Wi-Fi router from Telecom Square was so convenient and useful.